the highest possible level of energy efficiency. The Eaton UPS system met all of Sentrum’s requirements, with the company being particularly impressed by the modularity and scalability of the Eaton equipment, the high power rating it offers in a small footprint, and the exceptional levels of efficiency and reliability it delivers. Leading data centre owner and operator Sentrum has several data centres across the UK totalling over 130 000 m2 of space including technical space, disaster recovery suites and offices. 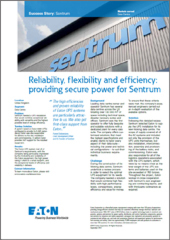 Sentrum was the first operator to offer fully bespoke and scalable solutions with a dedicated plant for every data suite. The company offers customised solutions that meet the highest specifications and enable clients to tailor every aspect of their data suite – including the power and technical configurations – to suit their individual business requirements.